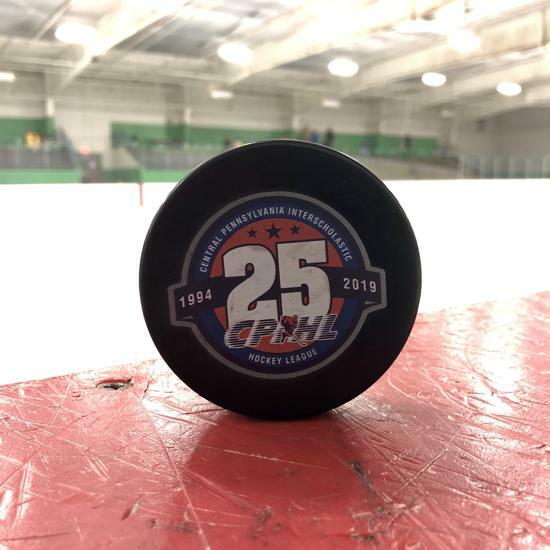 GET YOUR CPIHL 25TH ANNIVERSARY GEAR! CLICK HERE FOR PLAYOFF INFO!! 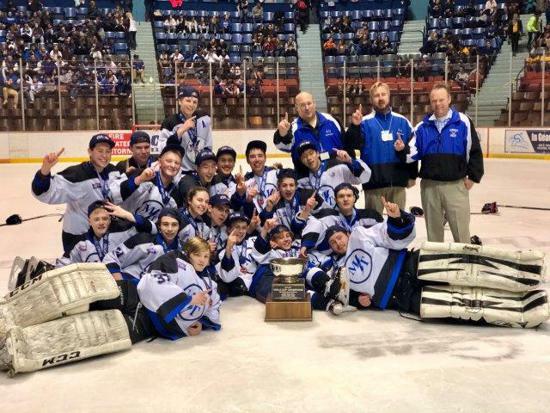 CPIHL WELCOMES SUSQUEHANNA VALLEY STAMPEDE! 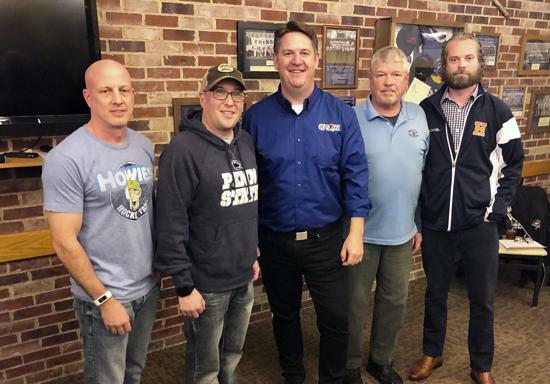 At the April meeting of the CPIHL Board of Directors, the league voted unanimously to welcome the Susquehanna Valley Stampede to the league. 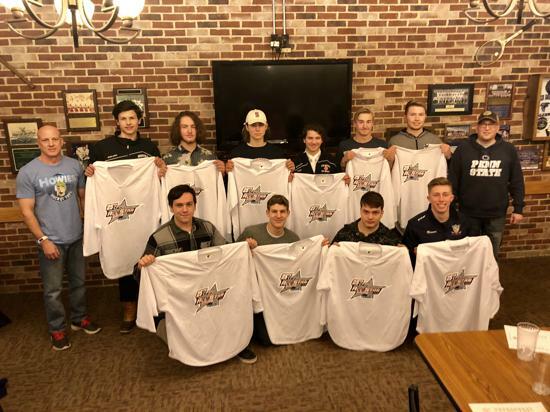 Formerly with the Northeast PA Scholastic Hockey League, the Stampede rosters players from several schools in the Sunbury/Lewisburg region. 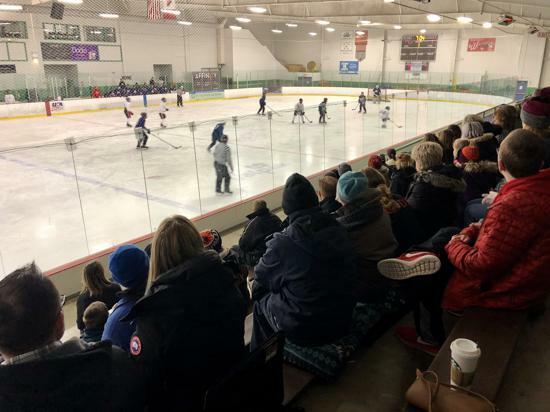 While they practice at a rink in Sunbury, the Stampede will play its home games at Twin Ponds East. The Board vote allows the Stampede to play on a one-season trial, which will be reevaluated in early 2020. 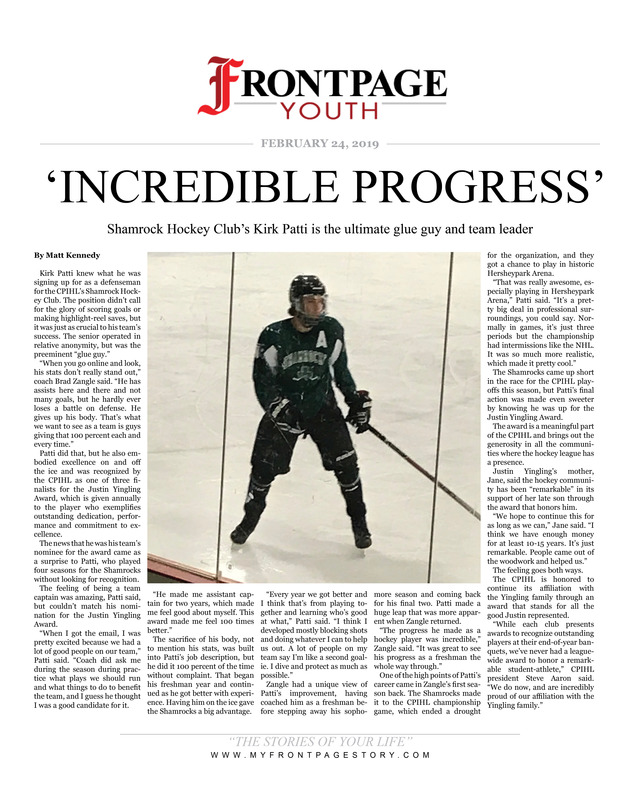 It is exciting to see our league grow. WELCOME TO THE CPIHL! 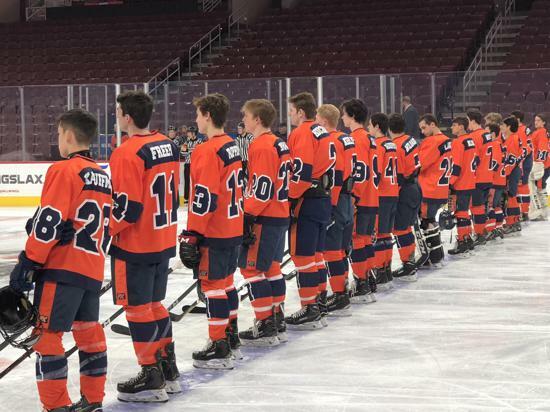 The Hershey Trojans' thrilling run to the Flyers Cup Championships fell short, losing to top-seeded West Chester Bayard Rustin, 5-1. 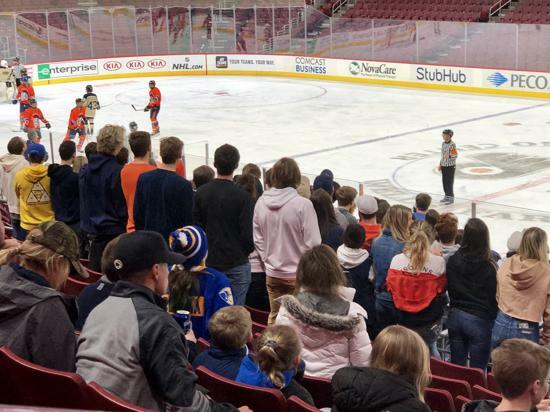 The Wells Fargo Center in Philadelphia saw a strong turnout from Hershey fans and the underdog Trojans played the favorites tough, trailing just 3-1 after two periods. 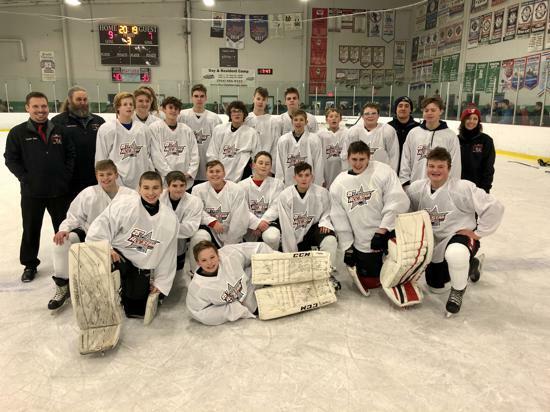 While it wasn't the result they were looking for, Hershey gave the CPIHL plenty of thrills during their postseason run! Freer Cuts Rustin's Lead to 2-1 with a Wicked Wrister! 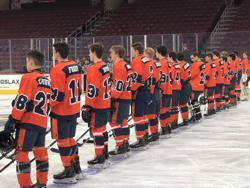 Hershey Trojans Take the Ice for Flyers Cup Finals! Legendary Hockey Broadcaster and Friend of Hershey "Doc" Emrick Sends Best Wishes to our Hershey Trojans! 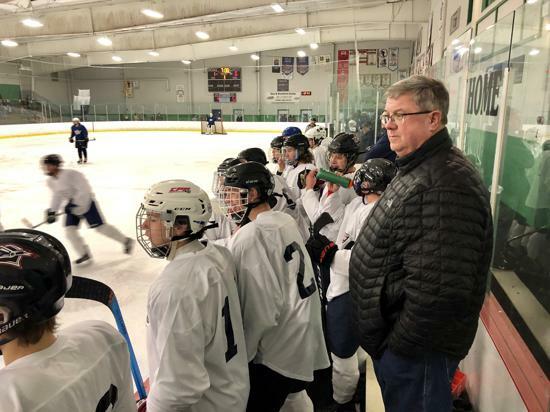 A Special Message to the Hershey Trojans from NHL Head Coach Bruce Boudreau!! 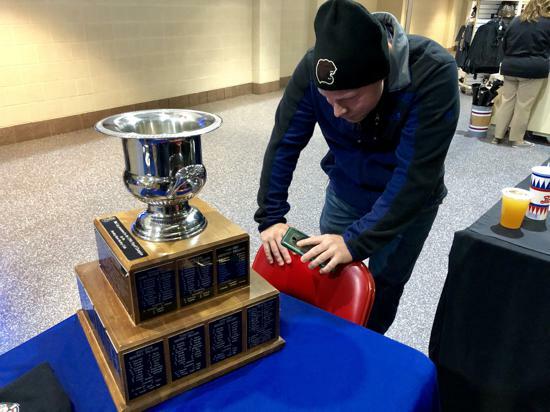 Bears Cup Returns to Hershey -- Warwick Wins Viola Cup! In front of a packed house at the historic Hersheypark Arena, fans were treated to two games that weren't decided until the final minutes. In fact, the Bears Cup final needed overtime. In the end, Warwick defeated West Shore 5-3 to win the Viola Cup. 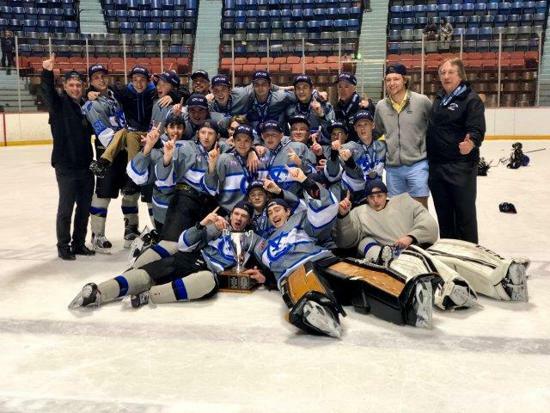 And Hershey beat longtime rival Palmyra 4-3 to take the Bears Cup. Thanks to all our fans who came out to support these four outstanding teams! Scroll down for great video from Championship Night! 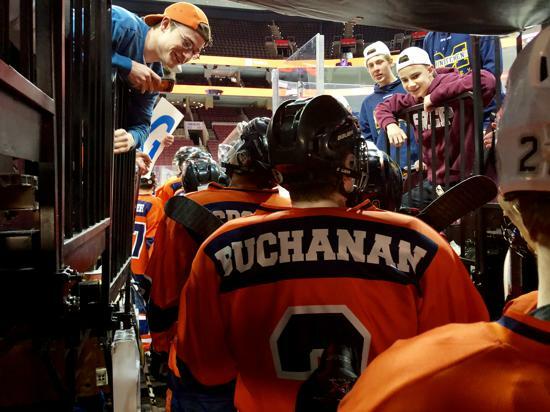 Hershey Bench Erupts as Bowman Nets OT Game Winner for Bears Cup!! Warwick Counts Down The Final Seconds in Viola Cup Win! CPIHL 3rd VP Kris Ricci Presents Viola Cup to the Warwick Warriors! CPIHL Commissioner Kevin White Presents Bears Cup to Hershey Trojans! Just Something Special About Hersheypark Arena! 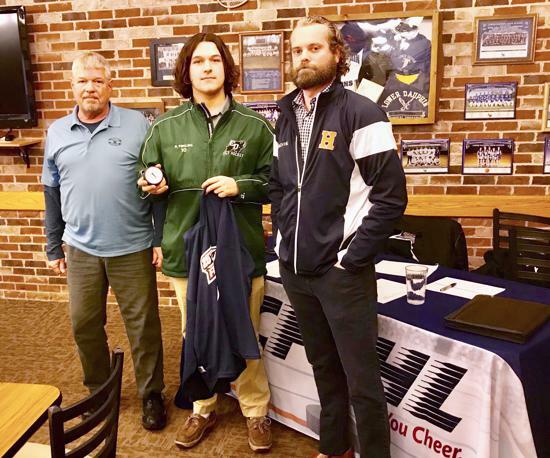 Logan Hann Wins CPIHL Justin Yingling Memorial Award! 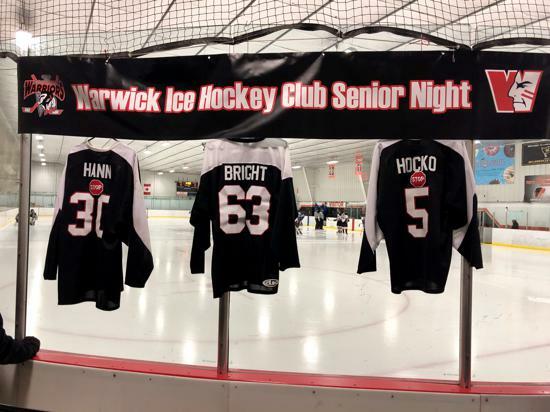 It was quite a night for Warwick's Logan Hann. 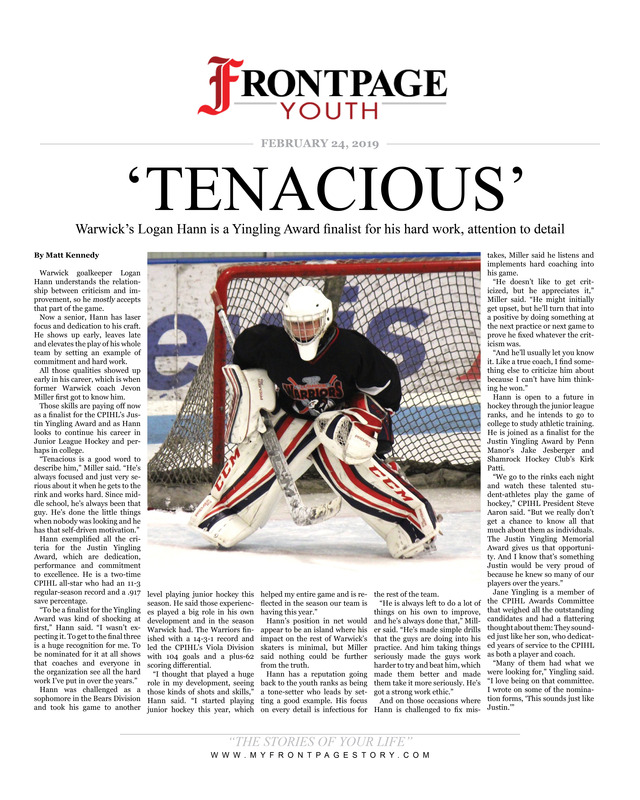 Shortly after backstopping his Warriors to a Viola Cup Championship, Logan learned that he was selected winner of the CPIHL Justin Yingling Memorial Award. 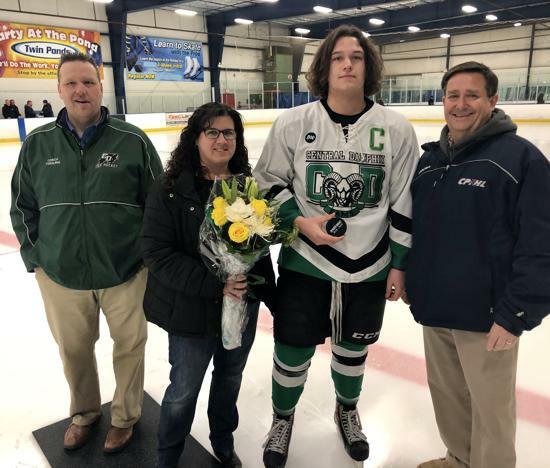 Presented to Logan by Justin's parents, Jane and Jack Yingling, Logan was recognized for his many outstanding qualities both on and off the ice. Also honored were award finalists, Jake Jesberger from Penn Manor and Kirk Patti with the Shamrocks. 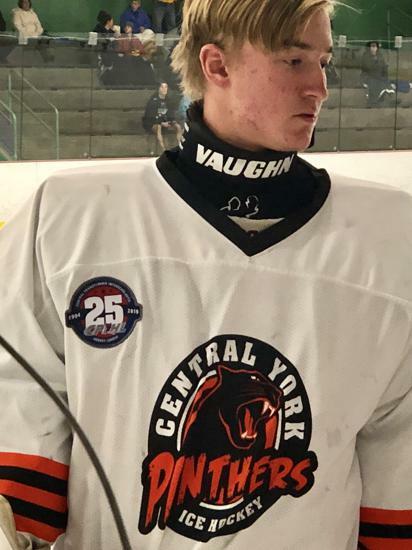 Logan received a $500 scholarship from the CPIHL! Be sure to grab your awesome (and free!) game program as you enter the Arena! We are excited to welcome fans to Championship Night this Friday, March 1, at historic Hersheypark Arena! Gates open at 5:15pm. Admission is $5, except for children 11 and under who are admitted for free, and covers both games. 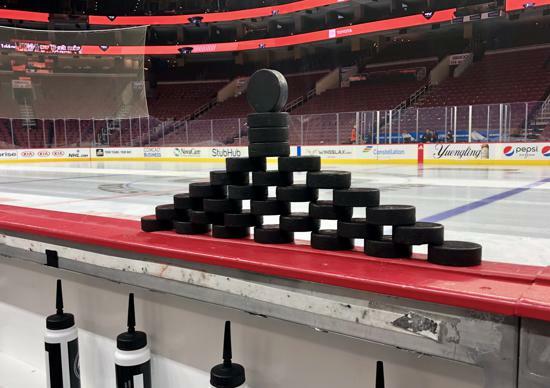 The Viola Cup game featuring West Shore and Warwick begins at 6:15, and the Bears Cup game featuring Hershey and Palmyra begins at 8:30. 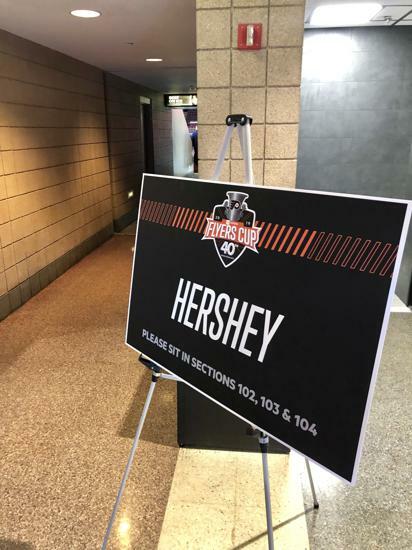 Enter at the main complex entrance at Giant Center and proceed through the booths following signs for Hersheypark Arena. 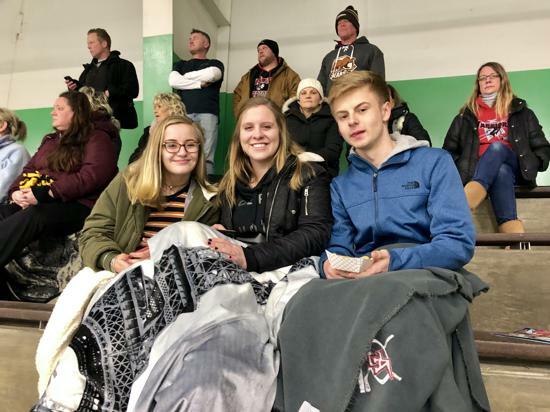 There is no parking charge; booth attendants will wave spectators through for free when you tell them you are attending high school hockey. 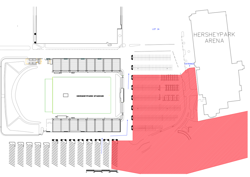 Due to the construction there is limited parking available in the eastern part of the lot between Hersheypark Stadium and Hersheypark Arena. All other parking is in the lot along the west side of the Stadium, as noted on the map. Once parked along the west side of the stadium, spectators should walk along the south end (box office) of the Stadium and then turn south toward the Arena, entering in Entrance Four. There are marked handicapped spaces in the lot directly across from Entrance 4 of the Arena. Please allow extra time due to a 7pm concert at Giant Center that night. Hershey and Warwick Punch Their Ticket to the Finals! 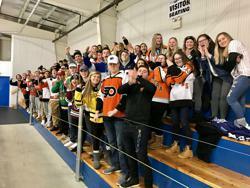 Hershey Fans Celebrate Moving on to the Bears Cup finals! 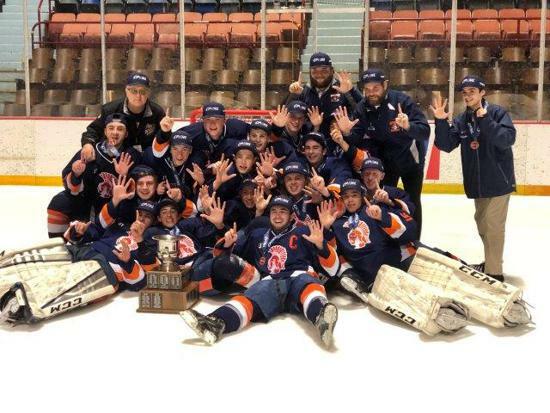 Congratulations to the Hershey Trojans and Warwick Warriors for advancing to the Bears Cup and Viola Cup finals thanks to their wins Monday night! Click here for the latest playoff details and updated divisional brackets. 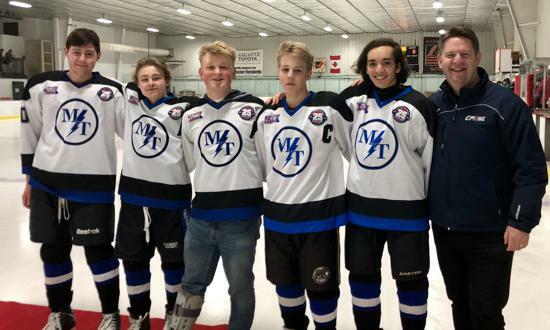 Meet Your 2019 CPIHL Justin Yingling Award Finalists! 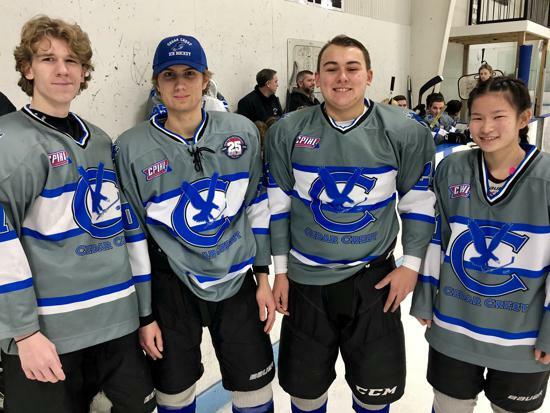 The CPIHL congratulates Logan Hann, Kirk Patti and Jake Jesberger -- named finalists for the 2019 CPIHL Justin Yingling Memorial Award. 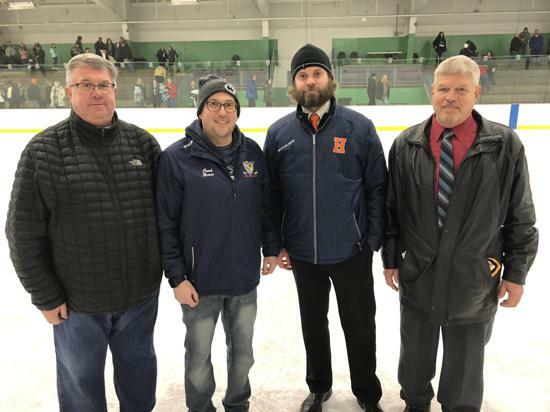 The three will be honored between games on Championship Night, March 1, and we will learn the winner of the $500 scholarship during that on-ice ceremony! Penn Manor's Jake Jesberger with the Game Winner against Hempfield Friday Night! 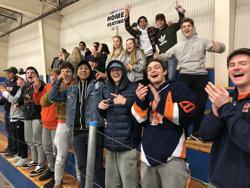 West Shore Advances to Viola Cup Finals! Congratulations to West Shore who advanced to the Viola Cup finals with their 4-0 win over Warwick tonight! They join Palmyra as the two teams that have secured spots on Championship Night next Friday. 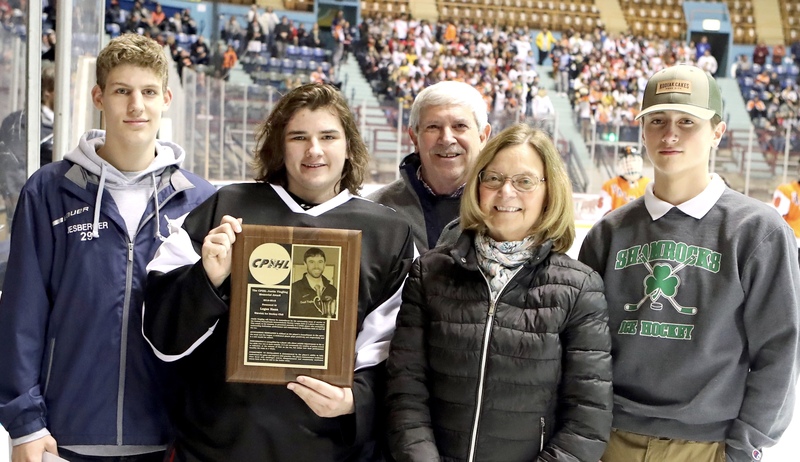 Finalists Announced for CPIHL Justin Yingling Memorial Scholarship Award! 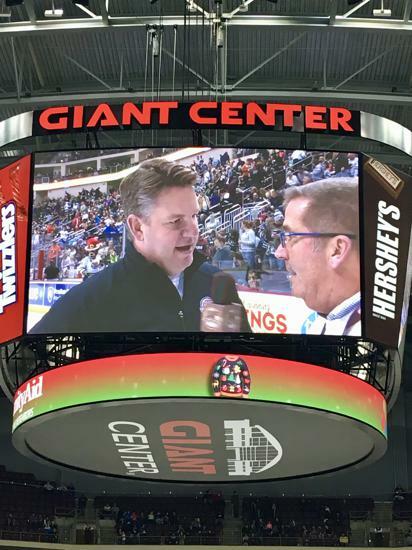 The winner, who will receive a $500 scholarship, will be named between games on CPIHL Championship Night at Hersheypark Arena, March 1. Click here to learn more about Coach Yingling and his remarkable legacy. 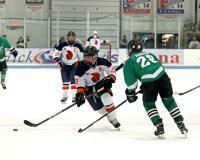 Palmyra Punches Ticket to Bears Cup Finals! The Palmyra Student Section Turns Out on Wintry Night! 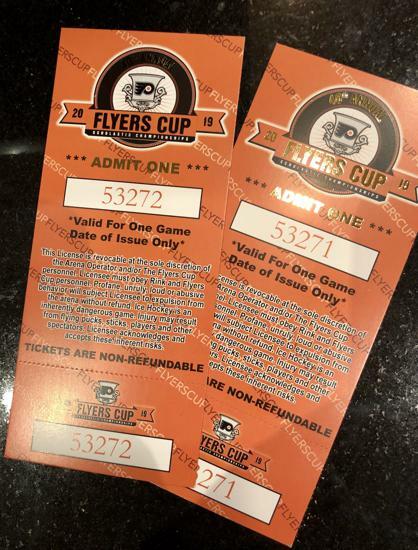 Congratulations to Palmyra who has advanced to the Bears Cup Finals with their 6-2 win over Hershey Monday night. In the Viola Division, Warwick advanced to the next round with a hard-fought victory over rival Hempfield, which remains alive in the double-elimination format. Visit our Playoff section by clicking here for the results and the updated playoff brackets! 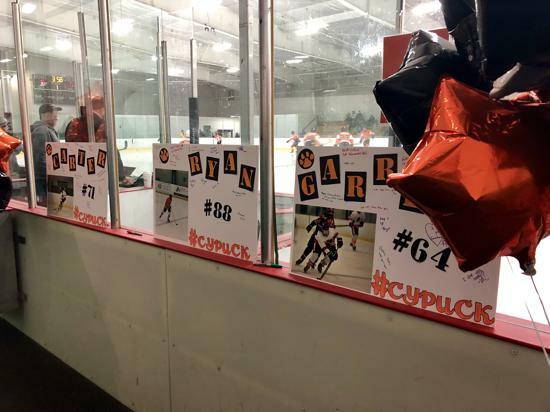 Inside the Locker Room With Palmyra Hockey! Time for CPIHL Playoff Action! 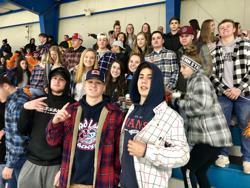 West Shore Fans are Ready for Playoff Action! 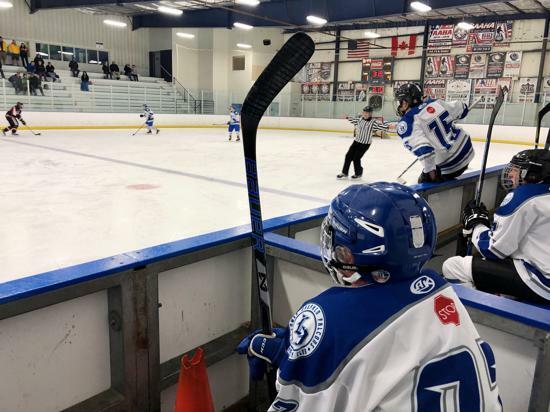 The last night of the CPIHL 2018-19 Regular Season featured some fantastic games. Goaltenders stood on their heads, goal scorers scored clutch goals and our fans were treated to some great hockey. Congrats to Hershey and West Shore which go into the postseason as the Bears and Viola Division #1 seeds. It all gets underway this Wednesday with the Bears Division Play-In Game. You can find all of your playoff info in our new Playoff Section which you can get to by clicking here. LD's Jeff Gross and Cedar Crest's Christian Hibshman Team Up for the OT Win! An Instant All-Star Classic! CPIHL All Stars Deliver Amazing Performances! Fans were treated to two terrific All-Star Games tonight in York. Here are some pictures from both the Middle School and High School games. Thanks to everyone who braved the extreme temps to come out and support these outstanding student-athletes! 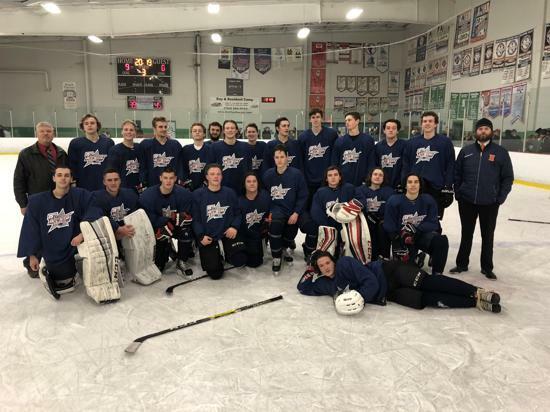 CPIHL All Stars Featured on Pennlive! The sports department at Pennlive has created this terrific gallery featuring our High School All Stars. Click here to check it out!! This is the week we pause - briefly - from the push to the postseason to honor our All-Star student-athletes. 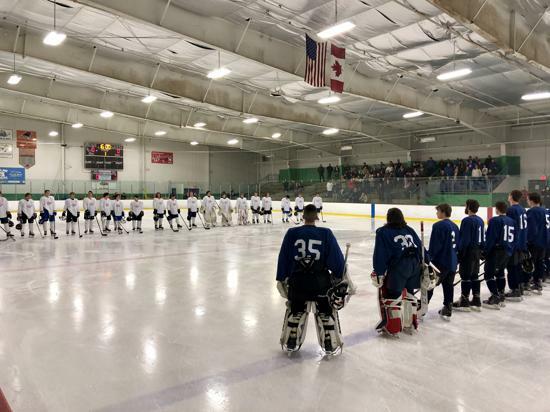 On Wednesday night, Jan. 30, the CPIHL will focus its attention on York Ice Arena where our middle school and high school players will shine in this always-fun exhibition. See you there! 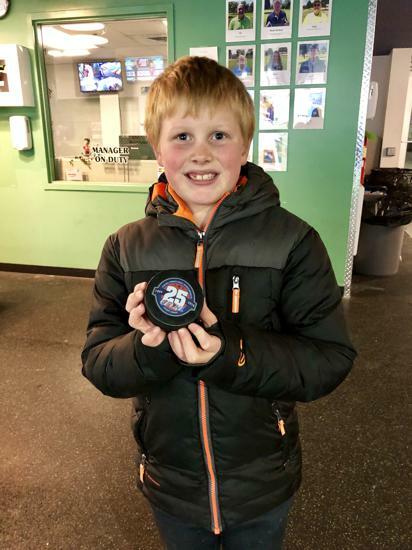 The CPIHL is mourning a member of our hockey family. 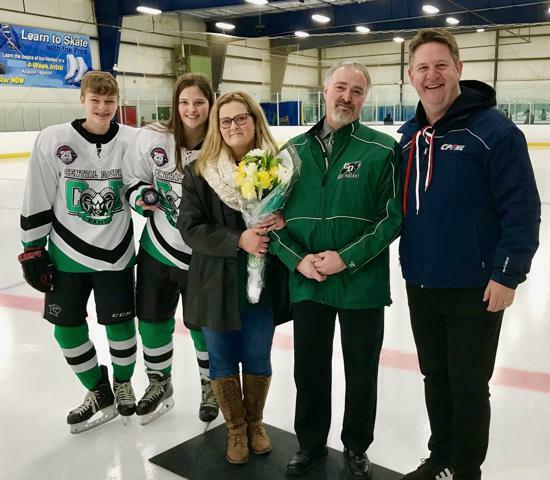 Kelly Soule, mother of Shamrocks player Michael Soule, lost her battle with cancer. 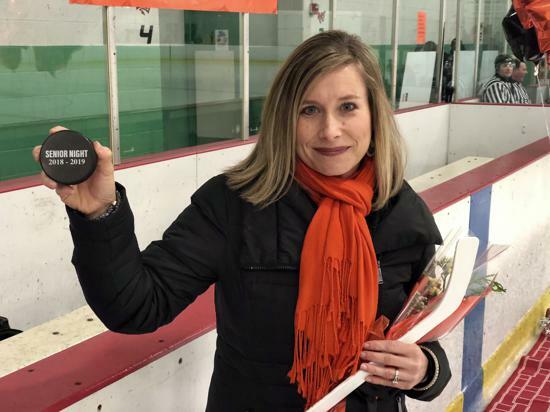 Kelly was a proud 'hockey mom' who was so excited that Michael was drafted for the 2019 All-Star game. She was able to see him in his All-Star jersey. 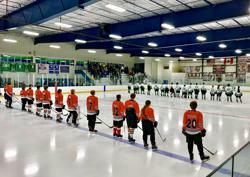 The hockey community is a strong one that comes together at times of celebration and times of great sadness. 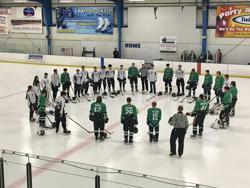 A moment of silence was held at our varsity games, including this one between the Shamrocks and Twin Valley. 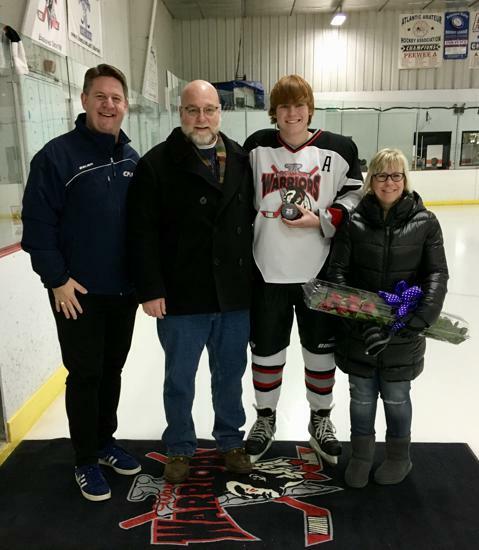 The CPIHL sends thoughts and prayers to Michael and his father, George. 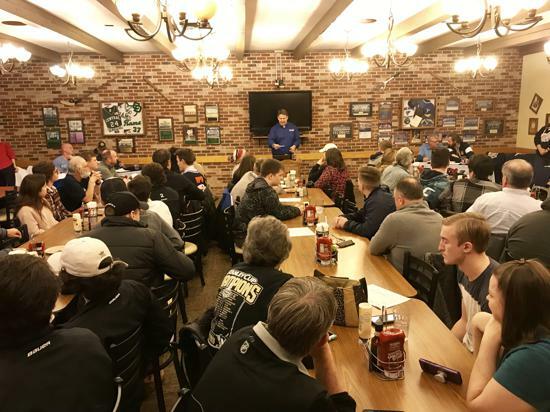 CPIHL All-Stars and their families gathered at Hoss's Restaurant in Hummelstown for Draft Night! Players were chosen for the National and American teams. The All-Star game is Jan. 30 in York. 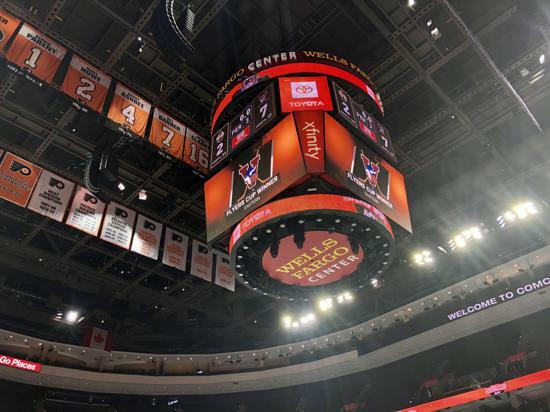 CPIHL 25th All-Star Game Logo Unveiled! 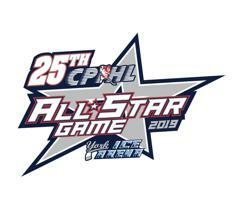 The CPIHL is proud to unveil our All-Star Game logo! This 25th Anniversary logo will be worn by our Varsity and Middle School All-Stars on Jan. 30 when the All-Star games are played in York. 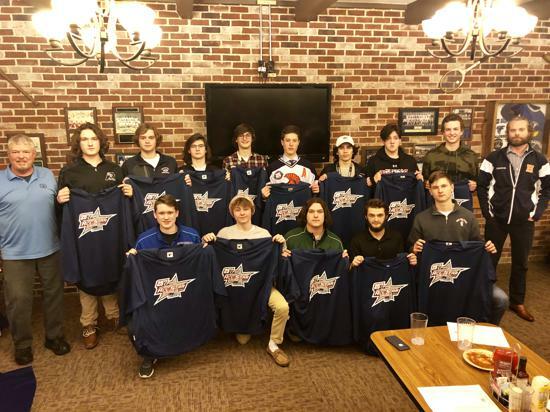 Varsity teams will be chosen during the annual CPIHL All-Star Draft on Sunday, Jan. 6 in Hummelstown. 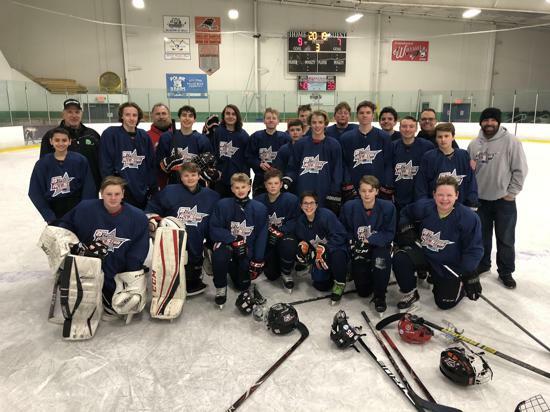 Middle School All-Stars will be presented with their All-Star jerseys prior to games throughout the month of January. All-Star apparel is now available for purchase. Just click the logo! 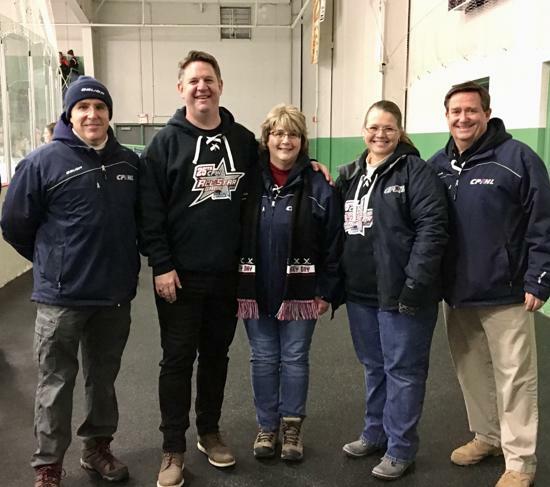 On Sunday, Dec. 23, Mechanicsburg alumni gathered at Twin Ponds West for a holiday game. 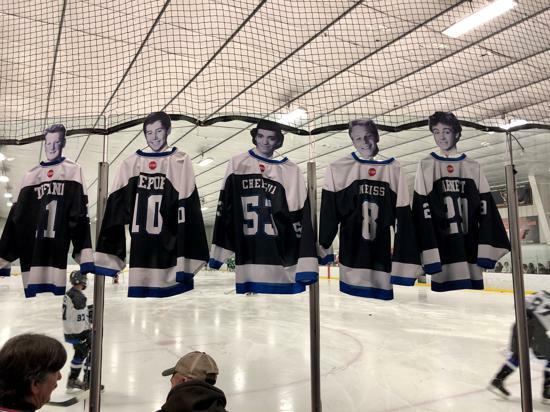 By the end of the night they had raised more than $500 for the CPIHL Justin Yingling Memorial Award. 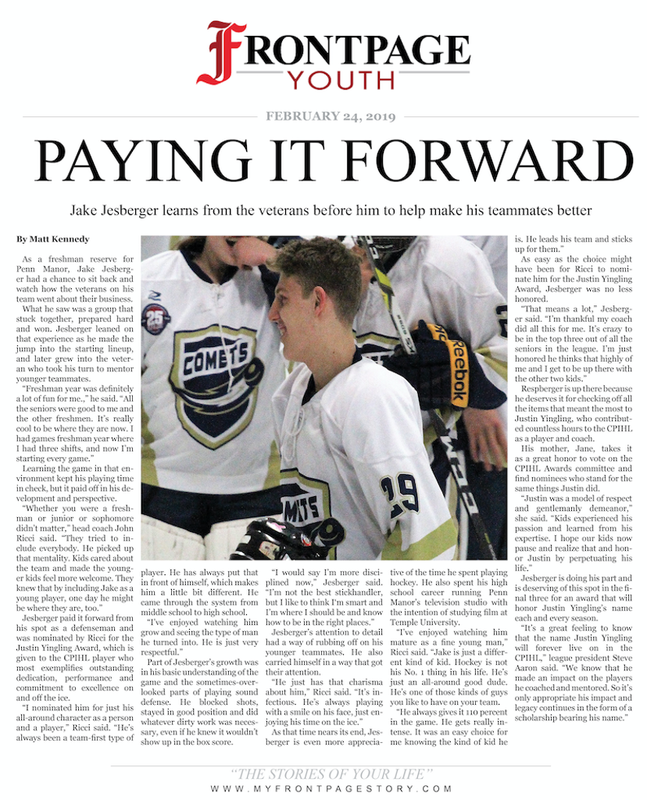 Thanks to all involved for showing the strength of our hockey community! 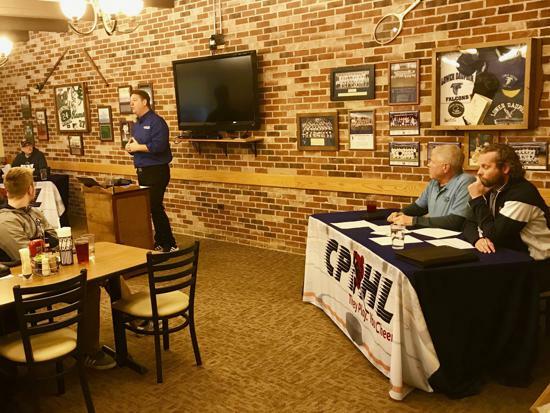 At the November CPIHL Board of Directors meeting, the 2018-19 Varsity postseason format was approved. The Top 3 teams at the conclusion of the regular season automatically qualify for the playoffs. The teams ranked 4th and 5th in points will play a one game 'play-in' game to qualify as the 4th playoff team. Those four teams will then play a double-elimination format as they compete for the Bears Cup! The Top 6 teams at the conclusion of the regular season automatically qualify for the playoffs. The 1st and 2nd seeds earn a first-round bye. 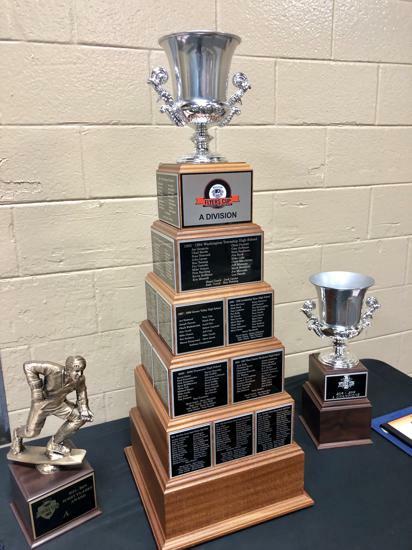 Those six teams will play a double-elimination format as they compete for the Viola Cup! Great Night Celebrating 25 Years of the CPIHL! 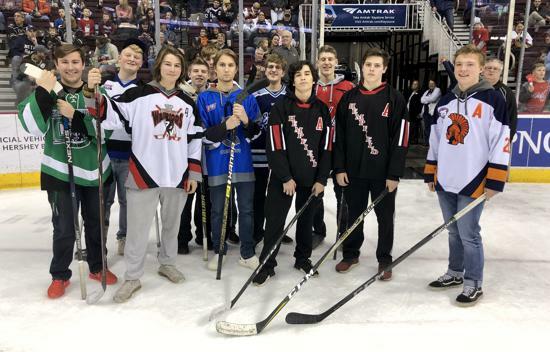 CPIHL players past and present, along with league founders, gathered at Giant Center Saturday, December 8, and were recognized on-ice between periods. CPIHL families also had the chance to take to the ice before the game for a free skate session. 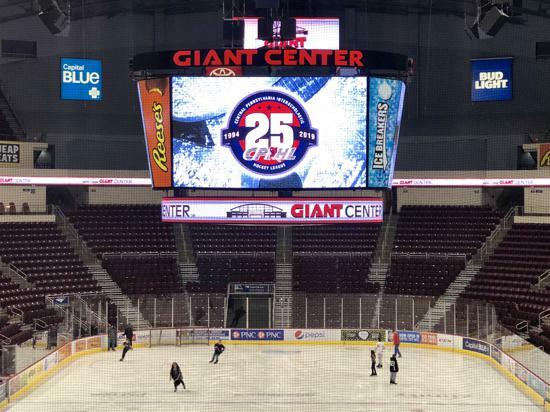 So great to see so many CPIHL-ers at Giant Center! Our 25th Anniversary season is officially underway! Celebrating 25 Years of the CPIHL! Click the logo to shop for 25th Anniversary gear! 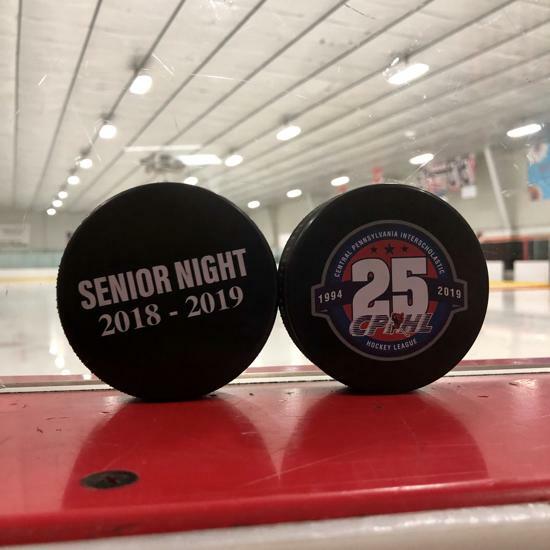 The 2018-19 season marks a huge milestone for the CPIHL, our teams and our players -- 25 years of scholastic ice hockey! And our league has never been stronger. 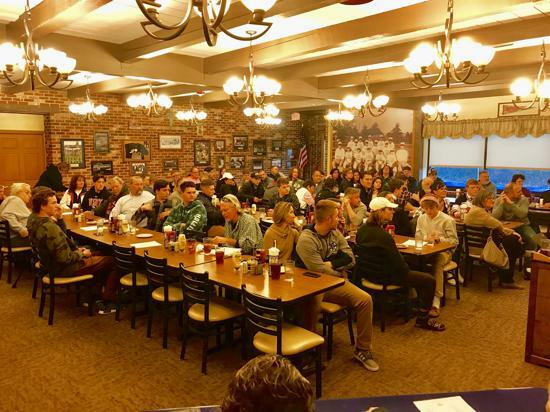 This year will feature nearly 45 Varsity, Junior Varsity and Middle School teams. 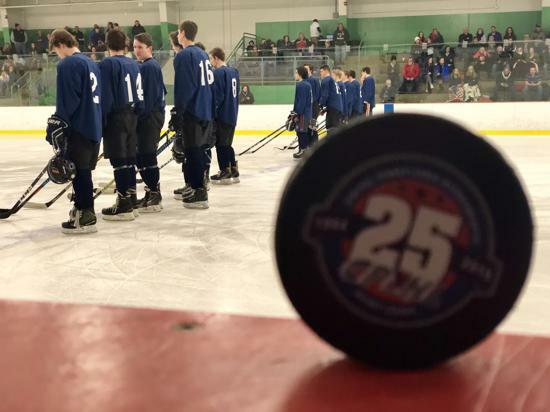 For the first time in our 25 year history, the league now will feature games played between our "pure" teams and teams that feature skaters from more than one school. It is a change embraced league-wide that will result in exciting new matchups and a chance for our fans to see talented players they have not had a chance to watch in previous seasons. We really like our 25th Anniversary logo and hope you do, too. Now available for purchase is Limited Edition 25th Anniversary CPIHL apparel. 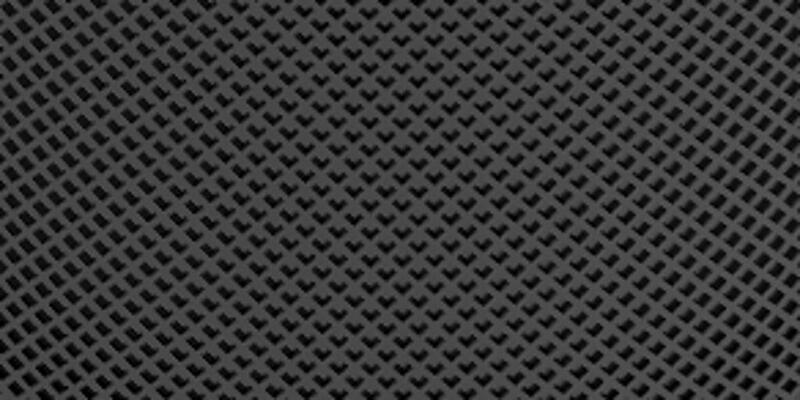 Click on the logo to be directed to our online store! 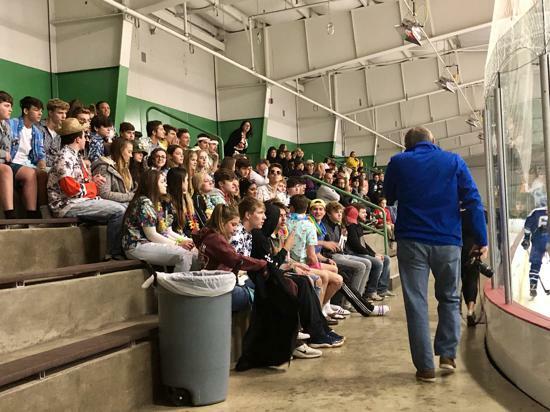 Welcome, Twin Valley Ice Hockey Club! 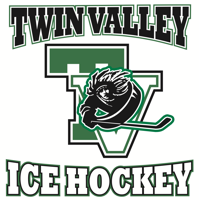 The CPIHL welcomes the Twin Valley Ice Hockey Club for the upcoming 2018-19 season! 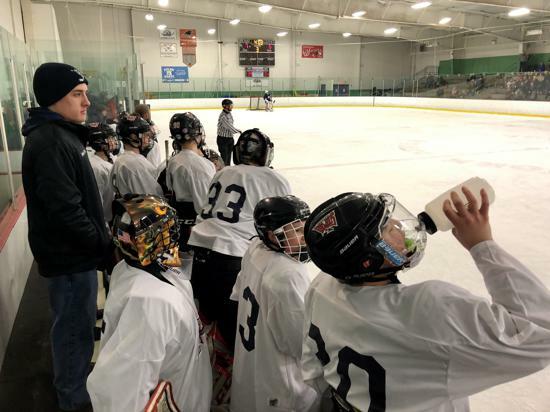 Located in Berks County, Twin Valley has made the move from the EPSHL to the CPIHL and will roster teams at the Varsity and Middle School levels. Regular Season 3-on-3 Overtime Is Here! 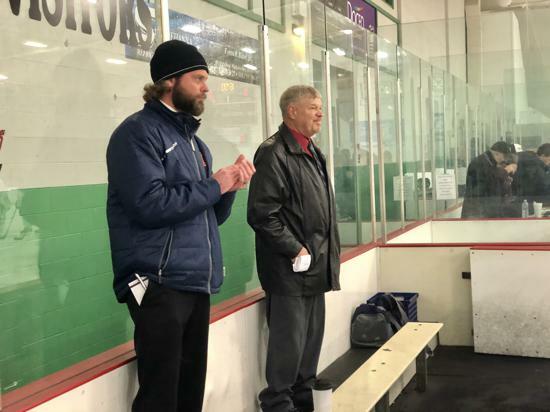 New for our 25th Anniversary Season, the CPIHL has approved 3-on-3 Sudden Death Overtime for the 2018-19 regular season. 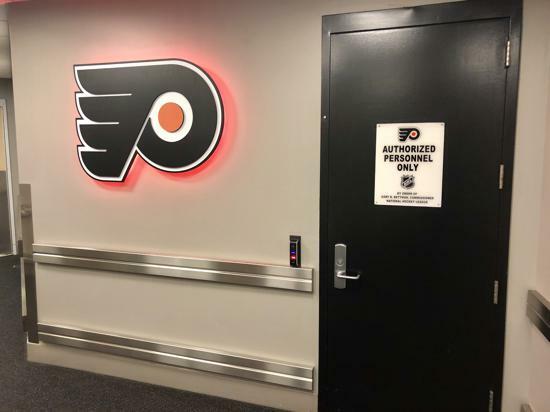 The five-minute period promises to bring the excitement featured in NHL overtime games to the CPIHL! 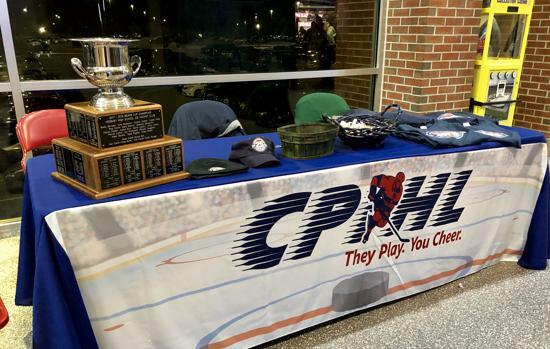 Just in time for our 25th Anniversary Season, welcome to the new online home of the CPIHL! Here you will find information about our league, teams, schedule, special events and much more. 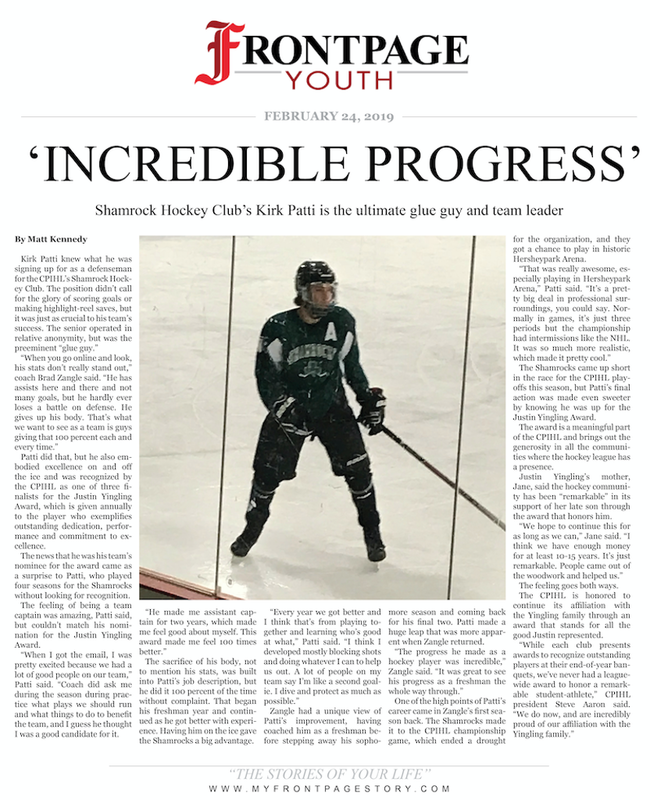 The CPIHL is proud to feature talented student-athletes from across Central Pennsylvania in both Middle School and High School. 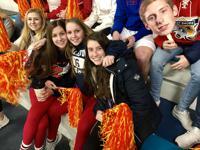 Our hockey players compete for the Bears and Viola Cups -- the pinnacle of high school hockey in the region. @AsmirMuhammad2 @BlueJacketsNHL @NickFoligno @Hershey_Hockey1 Yes, of course! Bears Cup. We must have been woozy from playoff excitement!! 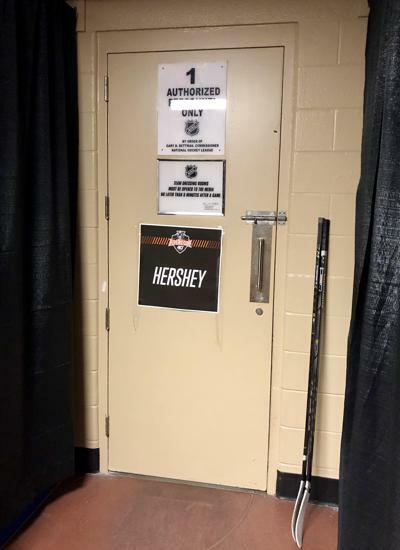 Support our Hometown Hershey Bears! 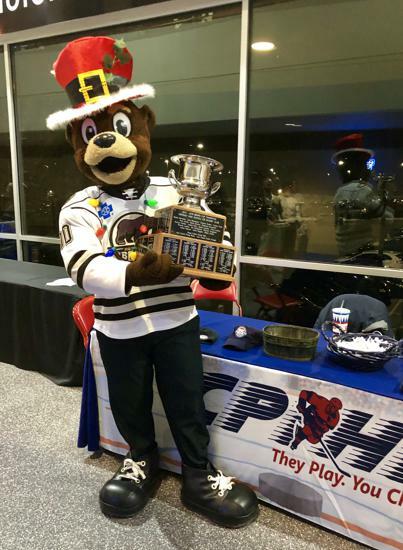 The CPIHL is proud to partner with the Hershey Bears -- the namesake of the Bears Cup! Thanks to the Hershey Bears, our All Stars were able to play on the outdoor ice at Hersheypark Stadium. 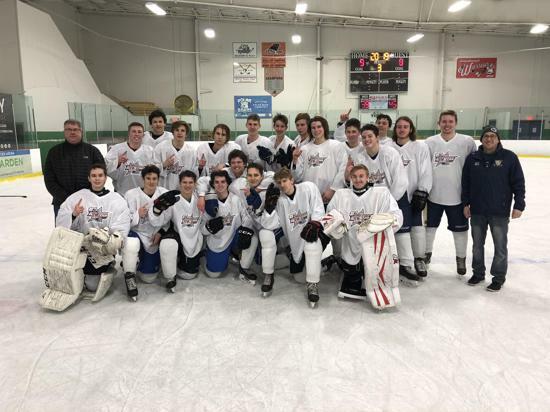 Congratulations to our 2017-18 CPIHL Champions!